You may think that during Holy Week the apposite programming would be sacred music, and in fact there were some interesting concerts offering the likes of Johann Sebastian Bach´s St John Passion and of Domenico Scarlatti´s Stabat Mater. But quite profanely I spent Saturday night seeing two ballets with Maximiliano Guerra (of which more below) and Sunday afternoon seeing the last performance of Mauricio Wainrot´s “Carmen” at the Colón, inaugurating their ballet season. Although here in BA Wainrot mainly works with the San Martín group, of chamber proportions, elsewhere in the Northern Hemisphere he has often worked with big companies, and he has also produced several ballets for the Colón. The subject had already involved him back in 2007 for the Royal Winnipeg Ballet of Canada, but then he had used an original score by Canadian composer Elizabeth Raum, which didn´t convince him. When he proposed a “Carmen” to Lidia Segni, Directress of the Colón Ballet, he wanted to use Bizet´s music for the opera, though arranged as a ballet and within the bounds of a sole act of 80 minutes. Composer-conductor Luis Gorelik was commissioned to produce a score along traditional lines, and he did so with material mostly from the opera, though adding musics of Turina and Albéniz. In B.A. we are well accustomed to Alberto Alonso´s cool, angular expressionism in the “Carmen” commissioned by Maya Plissetskaya on the unusual arrangement made by her husband Rodion Shchedrin for strings and percussion. The Alonso choreography as adapted by the diva´s brother Alexander Plissetski was seen here with Maia in 1976 and had a roaring success (one of her best roles). In 2004 we also saw the interesting version by Marcia Haydée on more conventional lines. 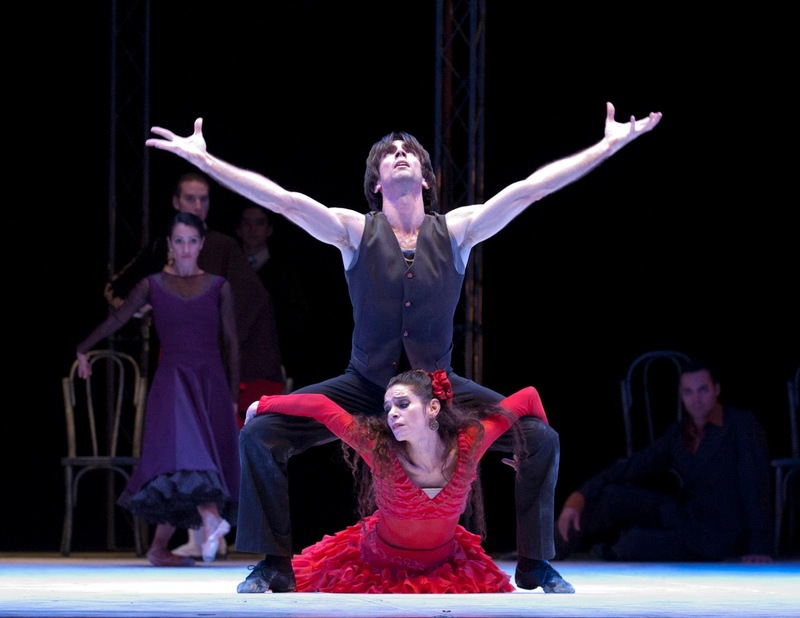 And well before that, the fascinating flamenco “Carmen” (no Bizet) by the Antonio Gades Ballet with Cristina Hoyos (also a Carlos Saura film). I have to be frank, the Wainrot version doesn´t compete. He chose an academic, Neoclassic language, which ill adapts to such a passionate subject, but even within that option I hoped for more imagination, based on many other Wainrot works that I find superior. The one good point is the introduction of Destiny as a main character, which concords fully with both Mérimée´s and Bizet´s essence. And “she” gets the best choreography. The bullfighter gets the worst, worlds apart from the visceral movements invented by Alonso. The rest is very conventional, skilfully done of course, but that´s the least to be expected from a seasoned choreographer. And it isn´t helped by Gorelik´s arrangement, workmanlike but flat (and routinely played by the Colón Orchestra under the arranger). It had a quality presentation by the same team seen in Winnipeg: stage and costume designs by Carlos Gallardo, lighting by Eli Sirlin, images by Ramiro Fernández. In the first cast (there were two) I especially liked Karina Olmedo (Destiny) and Juan Pablo Ledo as Don José. Silvina Perillo is a charming and accomplished dancer; however, she couldn´t go beyond the conventionality of Wainrot´s conception. Federico Fernández was below his best level as Escamillo; Maricel De Mitri was an appropriately sweet Micaela (well delineated by the chorographer) and Vagram Ambartsoumian, of imposing physical presence, was a fine Captain Zúñiga (murdered in this version). The others were in the picture, with some agreeable ensembles. Both Iñaki Urlezaga and Maximiliano Guerra are currently estranged from the Colón, probably with good reason. Both lead their own ensembles in other theatres. It isn´t easy to do so, for the Colón has resources they don´t have, but they persevere. Now Guerra with his chamber Ballet Mercosur presented in two consecutive nights a double bill at the ND Ateneo, a cozy theatre except for the uncomfortable seats. “Hotel de inmigrantes” is a 28-minute pleasant choreography by Nicolás Cobos and Paola Jean Jean based on a dramaturgy by Claudio Grillo and on tangos, milongas and “valses criollos” arranged by Daniel García (recorded) and with acting direction by Manuel Callau. In a rather disjointed manner it shows through small (sometimes too small) tableaux the gradual integration of the immigrants into a world of “orilleros”, “malevos” and “percantas” (my appellations) with a touch of social conflict, but popular rhythms bring enjoyment, leavened with some humorous bits. The whole group dances with gusto and some virtuosity, Guerra a “primus inter pares”. The “plat de résistance”, though, was the 39-minute “Ivan the Terrible”, choreographed by Guerra and Gabriela Pucci on dramaturgy and acting direction by Callau. Inaccurately the programme mentioned “music by Paganini”; not so, most of the music is from Rachmaninov´s “Rhapsody on a theme of Paganini”, plus fragments of Ravel´s “Valses nobles et sentimentales” and the great Waltz from Prokofiev´s “Romeo and Juliet”( I think). There´s plenty of mayhem on this capsule biography, showing the Czarina Anastasia as an iron-willed leader nurturing the child Ivan until she is murdered by the boyars; eventually Ivan is crowned, marries Elena and kills his adversaries, including Count Kurbsky. Too lurid at times, and with unpleasant stage designs by Sylvia San Martín, nevertheless this Ivan has some strong scenes. Fine dramatic work from Guerra, who still keeps well at 44; petite Tamara Barbadoro is fine as Ivan child; Javier Melgarejo provides a sinister presence as Kurbsky; and both Julieta Saravia (Anastasia) and Jorgelina Aguirre (Elena) were fine in their roles, all abetted by a well-rehearsed small corps de ballet.